My husband hates "themed" rooms. 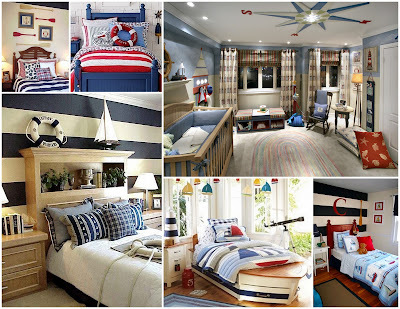 Basically that is a dirty word and when I'm trying to convince him to see how cute I could make Summit's room, I have to use special code words like, "Ben, lets use these CERTAIN COLORS", or "I like nautical LOOKING rooms". It's all about the verbal presentation. I say that it is because it has worked for me, this speaking in code, because my son's room has a nautical THEME. HAH! 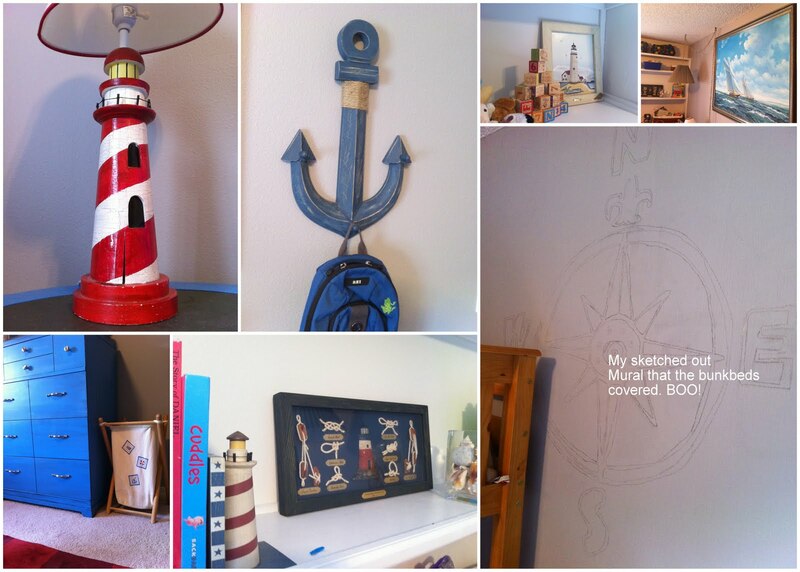 Side note: It wouldn't have worked though, for instance, if I had tried to pull off a sponge bob or race car room, I used such diverse decorations that it's more of a color palette than a bunch of light houses and sailboats- although it does have those. So, this other collage is parts of Summit's room that I have done. Most of that is garage sale finds from my mother-in-law that I wouldn't have bought but mehhhh it works and it was FREE! Also, if you can't tell from the picture angles, his room was a mess... lol, I had to work around it. You may remember some of the pictures from my post on faux-finishing his furniture HERE. As you can see, I still have a lot of work to do, but I think that is part of the fun of a room like this, I can continue to add odds and ends to better complete the room without it looking lacking right now. (other than the undecided upon mural...) I'm working on a fun bedding idea for the bunk beds and will post when I have more information!